Junija lani sem poskusila pobarvati volno z brezovo skorjo, ki sem jo nekaj tednov namakala v pepeliki: dobila sem umazano breskovo roza, ne prav močno barvo (slike žal nimam). Volno sem barvala v isti barvilni raztopini še dvakrat zapored. Ni se mi zdelo vredno, da bi volno take barve shranila za pletenje in sem obe štrenici (mislim, da sta bili dve) shranila, da bi ju uporabila kot volno, čimžano z brezovo skorjo. Štiriindvajsetega januarja sem imela barvilno raztopino iz drugič prekuhanih delov šentjanževke: cela rastlina, rastlina s cvetovi in samo cvetovi (ki sem jih poleti enkrat po kuhanju premalo posušila in jih nenamerno pustila plesneti). V tej kopeli sem hkrati barvala dve štreni po 20 gramov: volna, čimžana z galunom, se je obarvala lepo svetlo rumeno, volna, čimžana z brezovo skorjo, pa je dobila drugačno barvo - nekaj med bež, bledo marelično, breskovo oranžno in rumeno. Štrena, barvana samo z brezovo skorjo, je prva z leve, v sredini je volna, čimžana z brezovo skorjo in barvana s prekuhanimi ostanki šentjanževke, na levi je volna, barvana samo s prekuhanimi ostanki šentjanževke. 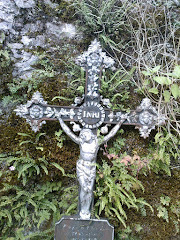 Pripela sem dve sliki, ker se ne morem odločiti, na kateri so barve bolj realne. Nisem se še odločila, za kaj bom uporabila to volno. Mogoče bom barve kombinirala z drugimi in spletla rokavice. 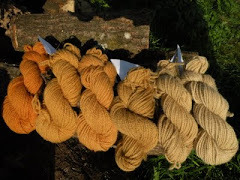 Last June I tried to dye wool with birch bark soaked in weak woodash lye for some weeks and got a dirtyish peach pink, not intense colour (sorry, no photo). 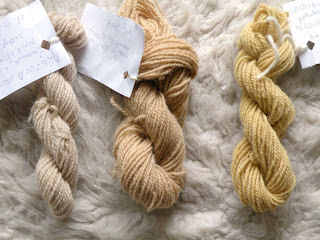 I also dyed in two exhaust baths, decided the colours were not worth keeping and saved two little skeins (at least I think they were two) to use them as birch bark mordanted wool. On 24 January I had an exhausted exhaust of St. John’s wort whole stems, stems with flowers, and flowers (the latter had been half dried after cooking and then moulded unintentionally). I dyed two skeins each of 20 grams: the alum mordanted wool gave a good pale yellow and the birch mordanted wool gave a different shade between tan, pale apricot, peach orange and yellow. 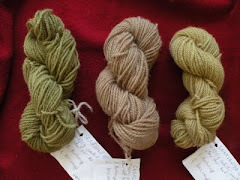 The birch dyed skein is on the left, the St. John’s wort exhaust dyed on birch mordant is in the middle and the St. John’s wort exhaust dyed on alum mordant is on the right. I attached two pictures since I can’t decide which one is more realistic. I have not yet decided what use to make of all these skeins. I guess I will make a colour combination with other colours for mittens. Nice to see other people using natural dyes. Hi Ladka for some reason all my e=mails to you came back. Thanks for your comments. I will put there more pictures when later. Anyway I am very lazy with internet. I love your blog. It is very interesting. I'm an italian feltmaker called Eva Basile, I do organise together with Barbara Girardi in Friuli, an italian region close to the slovenian border. I would like to invite you and more felters from the Balcans. send me an email so we can network! Hi Daniela! 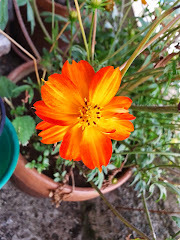 Thank you for following my blog! I hope the comments won't be a problem any more. I'm glad you like my wooly - felty - dye-y blog. What's more, I plan to start a bobbinlace blog, some time in the future (sigh). Just to tell you, I also natural dye cotton and linen yarn and fabric for bobbin lace doilies. I'm glad you chose to follow my blog. 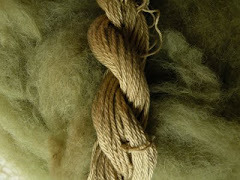 I was searching for felters (and natural dyers) in northern Italy on purpose, hoping for a meeting perhaps, or at least to be in contact on the net. I wonder if you also use wool from sheep similar to the jezersko-solčavska ovca breed which is somehow near the Bergschaf, if I'm not very much mistaken. I'd really love to know it, since I only dye this wool (for felting and knitting), and other wools for felting very rarely. I'd much appreciate your info.